In keeping with my corned-beef-and-eggs theme this morning, my hat’s off to Eater Ty Graham for sharing this bodacious breakfast with me. Brussels sprouts! Why didn’t I think of that? If you’ve got photos of your corned beef-leftovers, feel free to hit me with your best shot, tell me what I’m looking at, and I’ll add it to this post. 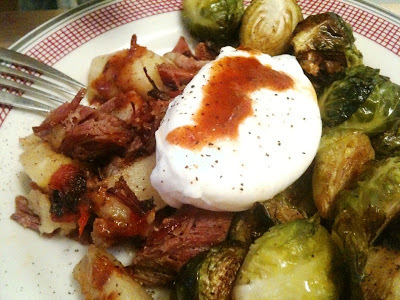 Corned beef hash with poached egg and Chicaoji — sprouts on the side.